Compaction Plus's Vertical Waste Compactors are ideally suited when available space for a compaction system is limited or the volume of wet waste does not justify a larger system. These units are great for shopping plazas, restaurants, cafeterias, fast food (QSR) locations, hospitals, nursing homes, schools, and much more. 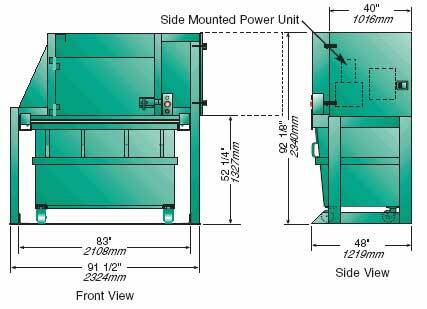 Use the TCG-Vertical Line Compactors for weekly volumes of less than 80 cubic yards of loose, non-compacted wet or dry general waste materials. Key unlocks the feed door. Dump wet or general waste materials into the feed area. Close the door to start the compaction cycle automatically. The crushing ram automatically stops at mid-point, creating a positive seal. Each unit is totally UL Listed to assure quality and maintains the highest industry standards. The TCG-Vertical unit can be easily changed from front to back to convert the unit to a front or rear feed application. The TCG-Vertical also has telescoping legs that allow it to accommodate a 4, 6 or 8 cubic yard container. This enables the unit to grow with your waste volume requirements. Packing ram maintains pressure against the refuse when the unit is not being used. This eliminates refuse "spring-back" and windblown litter. 48" high liquid retention level. 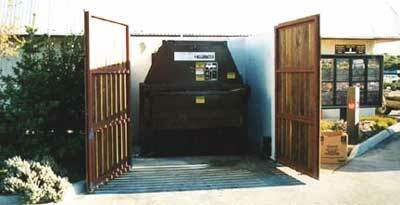 Feed door automatically locks to prevent unauthorized use of the compactor. The TCG-Vertical can be fed from inside a building with a security chute for controlled access. The TCG-Vertical saves on installation costs by requiring only 120 volts, a 20 amp outlet, and can be placed on any reasonably level surface. The Indoor TCG-Vertical 3 Yard Portable Packer has all the benefits of the larger 4, 6 & 8 Yard units AND it can be used inside a building or tight laneways. The compaction container can then be rolled to a truck accessible area for pick up. Most haulage companies will provide the movement of the container for you. TCG-Vertical Indoor or Laneway Compactor. Slim Line Design Only 48” Deep, (Front to Back) & 91” Wide. Electrical Components Comply with UL Standards. Now available with 3/4 hp, single phase, 120 volt power pack. Plug it into any standard 120 volt wall outlet! Contact Compaction Plus for a needs analysis and quotation.